Teachers share your lesson plans about Faith Ringgold with other teachers and students. Email to RinggoldFaith@aol.com to be posted here. In honor of Black History Month, I read the book, Tar Beach, and inspired third grade students to create their own perspective of a picnic on a rooftop in the city at night. 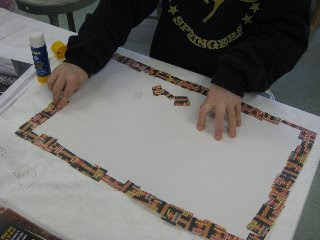 To begin making their art, students cut out squares of magazine paper and glued them around the perimeter of their page creating a unique, quilt-like border. 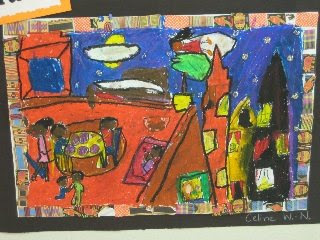 Next, students drew a scene of their family & friends having a picnic on a rooftop in the city at night using perspective techniques. 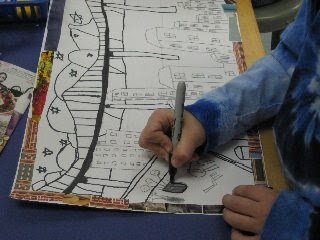 I provided students with visuals of rooftop gardens, bridges, skyscrapers, and city skylines to inspire their drawings. 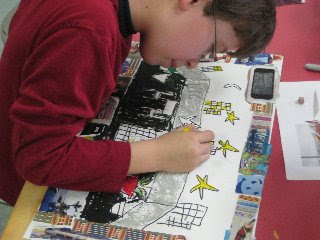 On Day 2, students outlined their drawing with permanent black marker and began coloring it in neatly with oil pastels. This boy has an interesting story: his dog ate his art work so he made another picture on his own because he liked it so much! On the last day, students finished coloring in their tar beach pictures and added gold & silver glitter where light would be reflected. 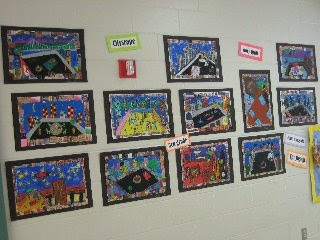 Then I mounted the works of art on black construction paper and displayed them in the main hallway along with pictures of Faith Ringgold and her art work. The End! -Ashley Cogbill, Art Teacher, Springfield Park E.S. My class is doing an Author Study on you. They are fascinated with your art and the stories that you tell. They like how you used your "imagingation" (we're woriking on a reading theme called "imagine that"). They are also learning a lot about African-American History. Thank you so much for inspiring my children! We are creating a presentation about you. We enjoy how your work explains your feelings and thoughts. We would like to know what you are creating now, and what do you plan to explore in the future. Thank you so much for these ideas. 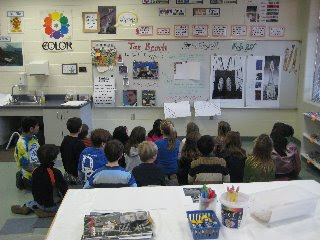 We are teaching a course about you and your art as part of our Art Lit program in our district. I didn't find your site until I had already scanned the handouts to post to our ArtLit site. Thank you for your ART, your heart and talent. In my Language Art class we are learning about your art and reading about you. 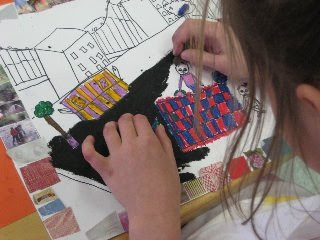 Since your story quilts involve many memories we are writing our own memoirs and creating artwork similar to yours. You are an inspiration for our class. P.S. We're in 6th grade. 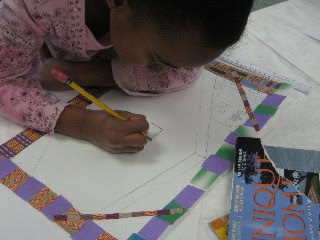 I teach art and my third grade students are creating "story quilts" very similar to the ones pictured above. 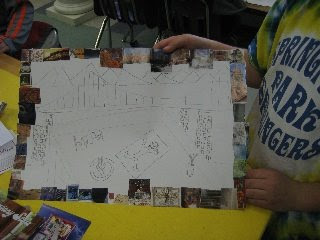 Students used 1 inch squares of wallpaper to create a quilt like border around their paper. They had to write five sentences and illustrate their story. I am creating a bulletin board focusing on you and your art to be displayed with some of their work to honor Black History Month. They have really enjoyed looking at your work!